We are not sure why we didn’t fall in love with the Polish Capital. Most of people say that Krakow is one of the most beautiful Eastern Europe cities and they would move there anytime if had the chance. Despite Krakow isn’t our favourite spot, we still have some tips to share about what we enjoyed during our short stay. Schindler List is one of Dale’s favourite film and he didn’t want to miss the opportunity to see with his eyes the factory where all happened. The historical museum inside is very well organized and will give you a great history lesson about the War World II. It is very easy to get to by taking inexpensive buses or trains that leave from the main stations in Krakow. It wasn’t the first concentration camp we saw and it’s not a cheery activity but definitely worth it to not forget such an important part of history. Pierogi are delicious traditional Polish dumplings that can have different fillings like meat, cabbage, mushrooms or if you have a sweet tooth blueberries, apples and strawberries. They are served in many restaurant, but if you are on budget you can buy them fresh from shops and cook them on your own, definitely cheaper! MOCAK is next door to the popular Oskar Schindler’s Museum, so it’s not too difficult to find. Its collection is a mixture of artworks by Polish and not artists from the late 20th century through recent times. Watch out for any temporary exhibitions. Also known as open-face sandwich, Zapiekanka is a popular Polish snack that can be bought in many places from street vendors. It can be topped with many different ingredients, so go crazy! If you see a queue somewhere, simply join in as we did! We’d love to hear more tips from you, to make sure next time we visit Krakow we will make the most of it! I’m very sorry to hear you didn’t like Kraków, my favorite city in Poland (even though I’m from Warsaw). That said, the last time I was there was around 2000 so it might have changed for the worse over the years. I understand that you chose to visit the “somber” places, and I appreciate that and command you for that, but there are also beautiful places in Krakow as well. I hope you’ll get to go back some time and visit those places as well. Maybe you’ll change your mind. I’d love to go back to Kraków Jolanta, everybody keeps telling us how much they love it so I’d like to give it a second chance. Mmmmmmmmm! Pierogi! The sweet versions sound delightful! The image you posted of Schindler’s factory is fantastic. It is awe inspiring to think of what he accomplished there and I think might be a perfect way to follow a trip to Auschwitz-Birkenau, which must be a very disturbing experience. I can confirm that pierogi stuffed with red berries are delicious, I loved them! The visit to the Schindler’s museum was very knowledgeable, we learnt details of that part of history we didn’t know about, shame there isn’t much left of the actual factory as it was back then, it’s still worth going though. Oh Krakow, as all the major touristic places is better to visit while you have a local person to show you around. This way you can skip all the touristic basics (ok, which for the first time visiting should be seen) and enjoy the beauty and stories of the city. For example, I would never have enjoyed Barcelona much if I have visited it during the scorching day and try to make my way in the river of tourists following the maps… I was lucky engugh to get magical night sightseeing experience and now whenever I come back I can explore the city on my own. 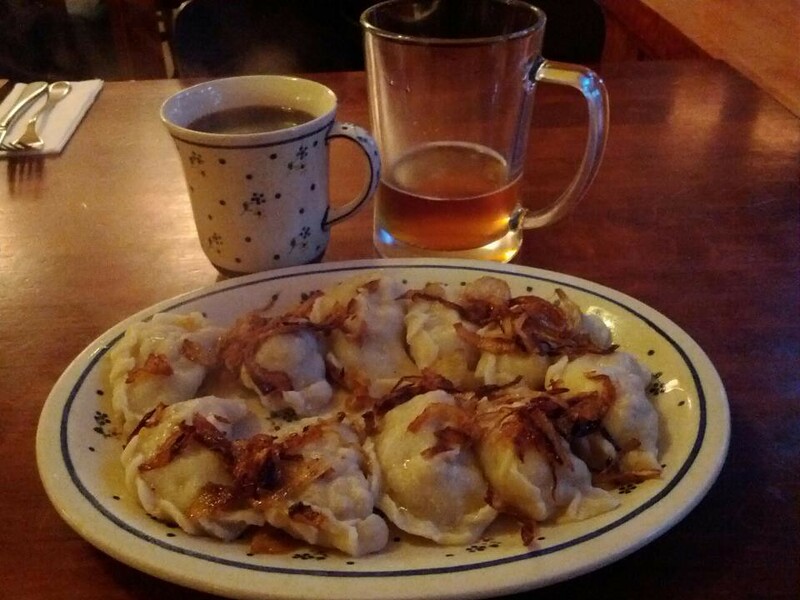 Pierogi is always a delicious treat 🙂 Thanks for sharing! Great to see an article on this city, we plan to visit this spring hopping over the border from Ukraine for a couple of days, and you’ve given us some good ideas of what’s available. Happy trails! It’s good to know that some of the recommendations we gave are going to be actually useful. Thanks for the tips. we are headed there this spring. You have given us some great ideas. How much time did you alot to visit Auschwitz? Glad to know those tips might be handy for you two. Auschwitz is a day trip, we spent half a day there with considerable time for each location. Kraków is amazing but lately I feel it’s changed a lot and lost its charm and unique atmosphere somewhere. it’s still hidden somewhere off the beaten path but sadly it’s not the same city anymore. I hope you’ll return to Kraków one day and so maybe I’ll be able to show you this nicer side of the city 🙂 but you tried famous zapiekanka, that’s the must experience in Kraków! which one did you have? Thanks Kami, if we ever go back to Krakow we’d love to have you showing us the nicer side of the city, that would be lovely. Thanks Kami, we’d love to see more of Poland, as you said I’m sure there is more to experience! I’m confused. I thought Warsaw is the capital of Poland. Did they change it to Kracow when I and Wikipedia weren’t paying attention? I have to admit, I have never really thought of visiting Poland, and while I have eaten pierogies before (courtesy of having a Ukranian/Polish… it’s a long story… grandmother), I don’t much care for them either! Then again, I’ve only had the kind that are filled with bland and boring potato… blueberry ones sound much better! We haven’t seen much of Poland a part from Krakow, I’d love to go back one day and see what else there is out there.